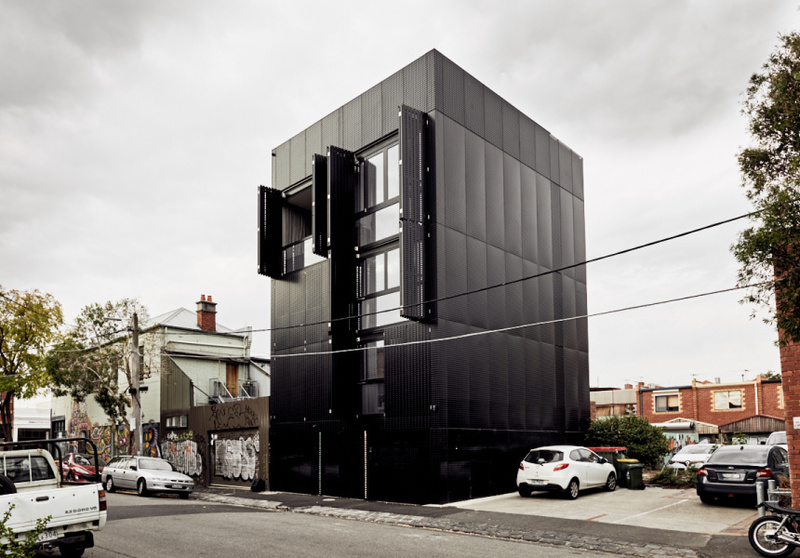 Two architects have tested the limits in creating their dream house in Melbourne’s north, which is very minimalist and very, very bold. 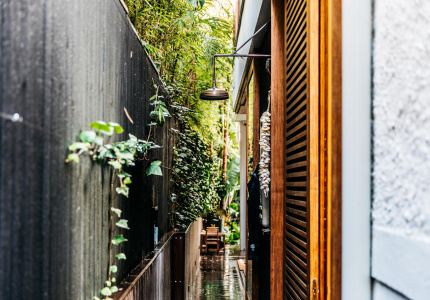 In the backstreets of Collingwood, just off one of Melbourne’s main thoroughfares, a slick black box rises between red-brick buildings and a graffitied garage door. This dramatic residence is home to, not surprisingly, two architects: husband and wife Jesse Linardi of DKO Architecture and Seada Linardi of SLAB Architecture. 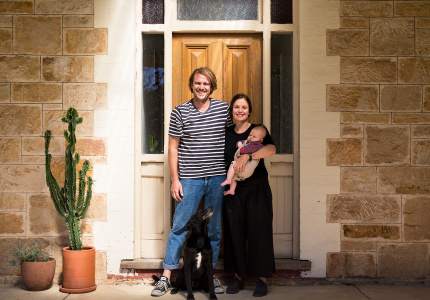 Designing their own home gave the couple the freedom to test their ideas and beliefs in a way architects don’t usually get to. “The house is very human and natural to live in, which may seem not an obvious response,” Jesse says. 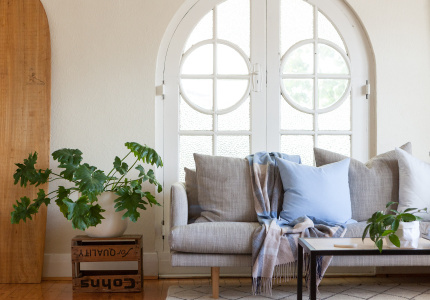 It’s moody and minimalist, but the Linardis feel their home also has a softness. 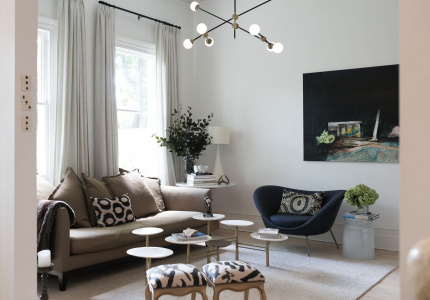 While the exterior – a six-storey cloak of custom punctured aluminium sheeting – is austere, inside there are warmer surfaces such as oak veneer, blackbutt hardwood, leather and linen curtains. There are marble accents in the kitchen and bathroom. But there’s certainly a connection to the facade, with blackened-steel kitchen benches and black glass shower screens – elements that aren’t unlike what you would find in a luxury hotel, the Linardis say. Every detail has been considered, with tailor-made joinery handles, hidden TV units and custom shower shelves. “Collingwood is almost cult-like in its community. It’s active, eclectic, unpretentious and accepting of culture, values and diversity. 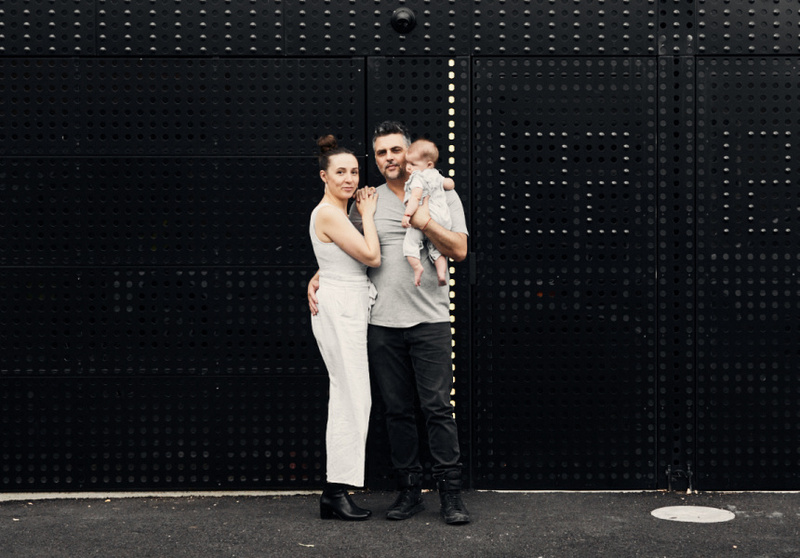 Our home is inspired by the diversity of the people in our neighbourhood,” Jesse says. Names: Jesse Linardi and Seada Linardi. 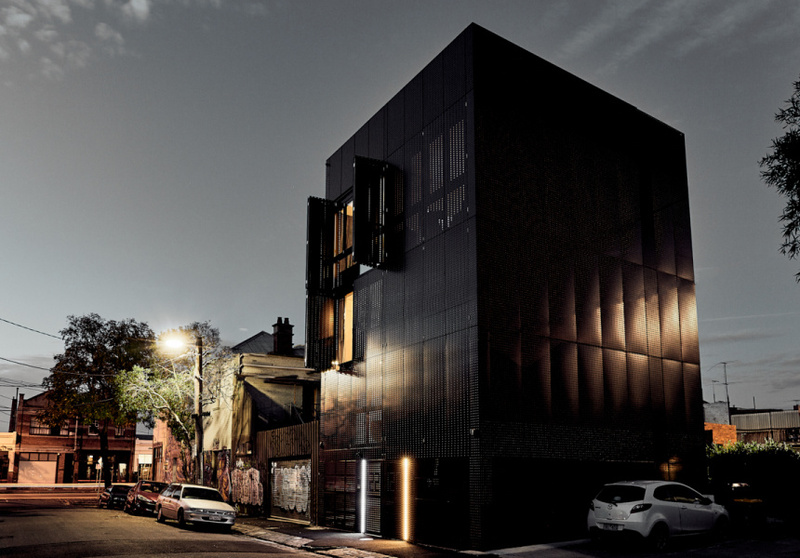 Live: In a contemporary six-storey townhouse in Collingwood, in Melbourne. With who: Their baby Savanah. The rooftop deck and pool. Watching the sunset behind the city from the pool, clad in bluestone, is sublime. Favorite item in the house? An integrated DJ console and hi-fi created by Carlton Audio Visual. Aside from family and design, our other passion is music, and it has always been a dream to have an audio set-up seamlessly and fully integrated. For furniture, we look at Cult, Space or Ajar. If looking for small designer objects or gifts, our go-to is Quirk and Co. We buy Art and Prints from Outré Gallery in the Melbourne CBD – great Mark Ryden selections. We find the process of reading and engaging in a bookshop far more stimulating than online searches. On weekends we often spend hours searching for new and interesting books in architecture and general design. Embiggen Books, Happy Valley and Readings are favourites. We love plants and flowers in the house, so The Hattie Molloy concept store is the next level in floristry, and a staple. It by far does the most creative and inspirational arrangements we’ve seen. Profile Music has the best selection of electronic music on vinyl in Melbourne – probably Australia. We get customised selections by the owner Steve.